Enjoy the unexpected? The cheeky? The irreverent? So do we. 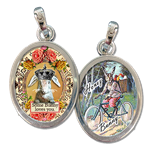 Our Bizarre art charms look at life from a unique perspective. Perfect for those who are artsy, edgy, fearless, and, yes, weird. Wear it proudly! Note: All charms come with our Magical Charm Clip!